Last Sunday afternoon, Todd, our dog Daisy, and I took a walk in the jungle. The weather was balmy, and it seemed like a good day for a leisurely hike. There are a number of roads heading east out of Olón; many start out as broad streets that narrow down to single-file paths as civilization wanes, and the jungle becomes denser. We saw the COOLEST thing! We hadn't gone far - in fact, there were still barb-wired private properties to either side (a spacious, open, grazing field on the left side, and on the right side there were more jungle-like thickets). The road was still wide, and hadn't narrowed yet into a trail - when Daisy suddenly stopped, looking at something underneath the luxuriant shady tree to our left, apparently spotting a small animal. In less than a split second, we saw an "el tigrillo" (little tiger- an ocelot, we think) come out from the foliage, (from our right) slink quickly across the road in front of us to retrieve it, and then she raced back, once she had the cub in her mouth (which is when I got the pic). I barely had time to snap this picture. Which is very blurry. See below. The tigrillo is leaping through the barb wire fence, with cub in her mouth. and next to fence pole in the center of the picture. First of all, this happened before we even got into the jungle, and because they are normally nocturnal creatures. “The scientific name is “Leopardus pardalis”. The tail of the tigrillo (little tiger as it’s called in Ecuador) is longer than its rear leg, which makes for easy identification. 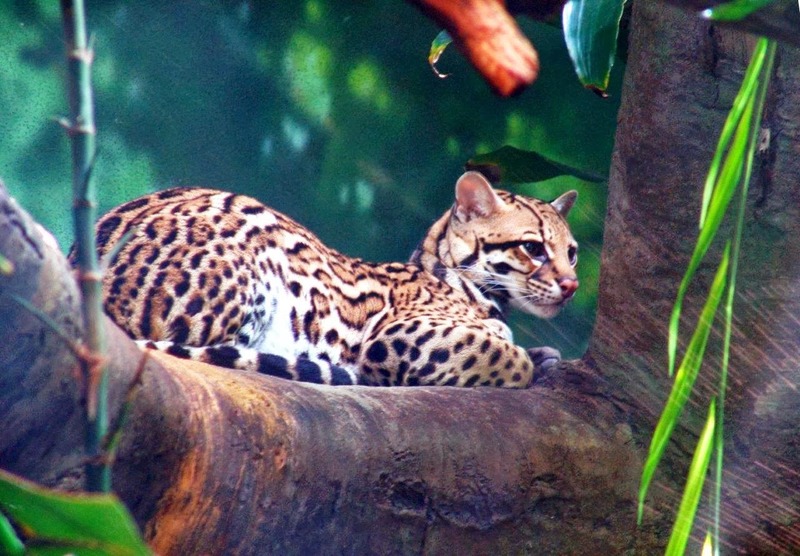 Although occasionally active during the daytime, ocelots are predominantly nocturnal. During the daytime they often sleep in trees. Prime viewing: Lowland and mid-elevation forests throughout Ecuador, although most common the Amazon basin”. I'm telling you, we were thrilled! I don't know what are chances are of commonly seeing an ocelot (in our coastal area of Ecuador, and in the DAYTIME!). And especially that mama had let the cub venture from protective, thick foliage on one side of the road, to sit under a tree, in a relatively open, sunny, and exposed field all by itself. It was a spectacular creature! Todd got a little better look, because I was fumbling with the camera. We proceeded to stumble upon a few other splendid things. We didn’t see many of the colorful birds we’ve seen in past, but the butterflies were beautiful, especially the iridescent blue ones. if you can spot him. At one point, as we got deeper in the jungle, we heard a great commotion in the trees next to us, and caught a glimpse of a tail climbing down from one of them (brown or black, but definitely not as fluffy as the squirrel‘s tail), and figured them to be monkeys (“howling” monkeys the most common around here). We hadn’t prepared well for this hike, because we planned for just a short walk. We were wearing only the briefest of clothes, and flip-flops. We were not exactly dressed right to go much further into the jungle. We had no water with us, or even our “Leatherman”… Dumb. We wanted to go in further – we wanted to see more. We were headed into “lions, tigers, and bears ---OH MY!” territory. There comes a point along some of these anorexic jungle paths that you have to choose between looking down to see the “ekkie” (fer-de-lance) snake before stepping on one, and looking ahead/above before that huge spider web finds your face first, before you see it. years ago...you get the idea. Not five minutes after we reversed (still pretty deep in the jungle), we heard a growling thing coming from the underbrush…Or over head? It was a distinct growl. Todd was a little ahead of me on the single file path. We both froze, had enough time to both say & agree “that was a growl”, when it happened again. We froze once more. And then SLOWLY CREPT AWAY as soon as soon we thought prudent. I’ve always thought I would be sort of scared going into jungles (was NOT on MY “bucket list”), since I hate bugs (though I do okay with snakes, mice, bats, lizards, etc.). And I never expected to enjoy poking around our jungle areas as much as I do. Heading home after our adventure.